Preheat oven to 175 °C. Lightly grease a 9" pie pan. 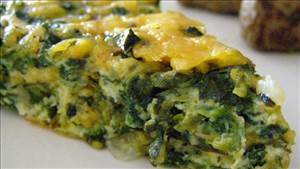 There are 328 calories in 1 serving of Crustless Spinach Quiche. Calorie Breakdown: 69% fat, 6% carbs, 25% prot.